For those who don’t get the luxury of flying Business Class every time you fly, you might not realize all the perks included in this ticket. As you make your way to your Economy seat, it teases you with passengers lounging in their comfy seats with their legs stretched out, some already sipping on the complimentary bubbly champagne. While those perks are nice, there is actually more to this ticket than what meets the eye. Today, we’ll discuss all the perks Business Class has to offer and why you may want to consider splurging for a ticket. We all know the feeling of getting to the airport, luggage in tow, only to be greeted by long lines and frustrated passengers. However, for those who have the golden ticket (a.k.a. a Business Class ticket), their airport experience is a lot nicer and a lot less frustrating. This is because there is a dedicated check-in desk just for Business Class ticket holders. If you plan to travel during a busy season (any holiday season) or if you plan to travel on a Sunday (the busiest flying day of the week), then you may want to consider upgrading your ticket, so you can skip the regular queue and spend more time at the airport bar before your board your flight – sure sounds worth it to me! There’s some airlines who offer Business Class passengers an additional check-in and carry on baggage, free of charge. This can be a huge perk as an Economy Class tickets are limited to one check-in and carry-on bag, usually at a charge. One of the biggest perks included in a Business Class ticket is access to the private airport lounges – most airlines offer this service. Though not all lounges are the same, most will provide comfortable seating, sleeping areas, shower facilities, and an exclusive food service. If you’re traveling with Emirates, you can opt for a massage or a manicure or visit their cigar bar while you wait for your flight. When you fly Business Class you will get to avoid the long line waiting to board the plane. You will be seated way before the Economy Class even shows their passports. You will also be offered priority service and, of course, the complementary “welcome” champagne. Sip, sip, relax. 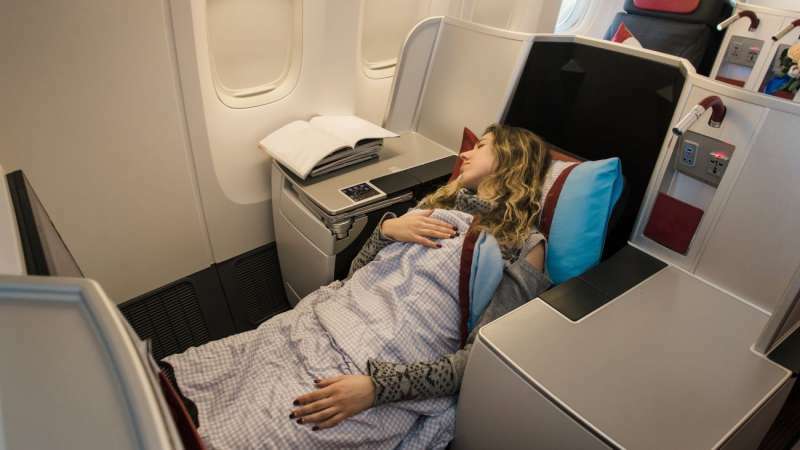 This perk is not a surprise, especially if you’ve flown before since you’ll walk right pass the Business Class to Economy and instantly become jealous of their bigger and better seats, some even lie-flat down and others even offer private suites. However, did you know that most airline will provide “turn-down service,” this includes bedding, loungewear, slippers, and a toiletry kit to meet all your comfort needs. Let’s be honest, airplane food isn’t the best, not to mention how expensive it is for a dry sandwich or questionable “mash-potatoes.” However, if you fly Business Class, you’ll actually experience an on-board culinary experience. Most airlines will provide award-winning dishes to choose from, crafted by famous chefs. You’ll also have access to an exclusive wine and beer list or enjoy the complimentary champagne throughout the flight. I’m sure we’ve all had an experience where we’ve hit the service icon button on the plane, only to be forgotten. Well in Business Class, you’ll get priority service throughout your entire flight. Whether you’re craving a light snack or another glass of champagne, or you just want to ask a question, an attendant will be at your service. In Business Class, you’ll enjoy exclusive access to extra channels and premium movies, you’ll also get to experience all your entertainment needs on a bigger and personal screen. The service doesn’t stop right when you get off the plane, some airlines offer a pre-booked complimentary chauffeur service. This definitely adds to the premium experience, no need to wait in long lines for a bus or taxi service. So, next time you fly you’re traveling in Business Class, right? Though the price of Business Class may turn you off, all of the above added features may make the ticket worth the price. There are also ways you can obtain a Business Class ticket without breaking the bank, like using credit card air miles. Even if you just experience Business Class once in your lifetime, it’s worth it.